Fontanel in Nashville will welcome several artists for an eight-week concert series, the Biscuits & Jam Concert Series, presented by AT&T U-verse. Country artists including Jana Kramer, The Farm, Holly Williams, Brett Eldredge, Elizabeth Cook, Sarah Darling, DUGAS and Nikki Lane, will take part in the series, which will be held at the 2013 Southern Living Idea House at Fontanel. The concert series will take place each Sunday from July 7 through Aug. 25; each concert will feature 60-75 minutes of music, beginning at 5:30p.m. Guests will enjoy acoustic performances and a picnic-themed menu that features Southern Living Test Kitchen recipes, as well as a complimentary signature biscuit. The Southern Living Idea House is open for tours from Wednesday through Sunday, 9 a.m. – 3 p.m. This year, the home was built on Barbara Mandrell’s former estate, and will later reopen as a boutique hotel. Tickets to view the house are $12, and a portion of the proceeds will benefit St. Jude Children’s Research Hospital. 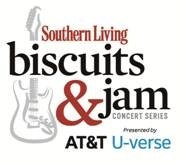 Tickets for the Biscuits & Jam Concert Series are on sale for $15 at fontanelmansion.com. For more information on the Southern Living Idea House, visit southernliving.com/ideahouse.